Shaped like a book, this compendium was intended to act as a set of covers for a notebook which could be bound inside it. 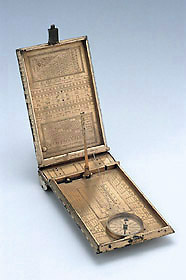 The device includes an adjustable string gnomon sundial and a compass, as well as an assortment of calendrical, astrological and arithmetical tables. Though scarcely a military device it also carries a miniaturised set of gunner's gauge scales, nominally for determining the weight of cannonballs. The fine gilding and decoration are typical of the work of Erasmus Habermel, court instrument maker to Rudolf II in Prague.